Some student pilots get the idea that the number of hours they spend before soloing is a good measure of their piloting skill. While it is true that, all things being equal, this might be true, all things are rarely, if ever, equal. Instead, the actual number of hours it takes before that first significant milestone in a person's flying career is dominated by a number of other factors. The calculator below is a joke. That is, it has no basis in reality or accuracy outside of the very general notion that it attempts to illustrate how factors may influence time to solo. Give it a try and see just how inaccurate it is! Instructions: if you need instructions on how to use the calculator below, you should not be allowed near scizzors, much less an airplane! My CFI is younger than 25. My CFI plans on an airline career. I am the first student that my CFI will solo. I fly from an uncontrolled field. My field is too short for (or otherwise does not allow) touch and go landings. I train out of a class C airport. I train out of a class B airport. I fly an aircraft other than a 150/152/172/Katana/P28A. 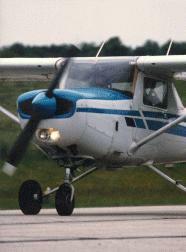 My aircraft has a controllable-pitch propeller or retractable gear. I consider myself to be a superior pilot. I consider myself to be an inferior pilot. I have discussed with my CFI the fighter plane I would some day like to fly. I have taken and passed my FAA knowledge (written) test before soloing. I have played Flight Simulator or a similar product in preparation for my real-life flying. I own a pair of rudder pedals for my personal computer that I use with my Flight Simulator program. I only manage to fly (because of weather, schedule, etc.) about twice a week or less. I fly a taildragger aircraft such as a Piper Cub. I have in the past flown with relatives or friends often in their small aircraft. your scientifically* determined time to solo is: hours.